This is an image map of an extended tree pit, clicking on components will load the appropriate article. 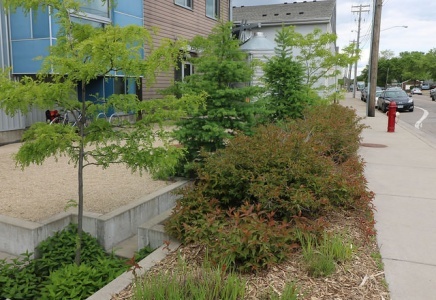 Trees can be incorporated into bioretention cells with other plant types, or otherwise into their own planting pits. direct infiltration from permeable pavingAn alternative practice to traditional impervious pavement, prevents the generation of runoff by allowing precipitation falling on the surface to infiltrate through the surface course into an underlying stone reservoir and, where suitable conditions exist, into the native soil..
UnderdrainA perforated pipe used to assist the draining of soils. InterceptionThe interception, storage and eventual evaporation of rainfall from vegetation canopies. Tree canopies intercept and store rainfall, thereby modifying stormwater runoffThat potion of the water precipitated onto a catchment area, which flows as surface discharge from the catchment area past a specified point.Water from rain, snow melt, or irrigation that flows over the land surface. and reducing demands on urban stormwater infrastructure (Xiao et al., 1998; Xiao et al., 2000; Xiao and McPherson, 2002; Xiao et al., 2006). Canopy interceptionThe interception, storage and eventual evaporation of rainfall from vegetation canopies. reduces both the actual runoffThat potion of the water precipitated onto a catchment area, which flows as surface discharge from the catchment area past a specified point.Water from rain, snow melt, or irrigation that flows over the land surface. volumes, and delays the onset of peak flows (Davey Resource Group, 2008). The extent of interceptionThe interception, storage and eventual evaporation of rainfall from vegetation canopies. 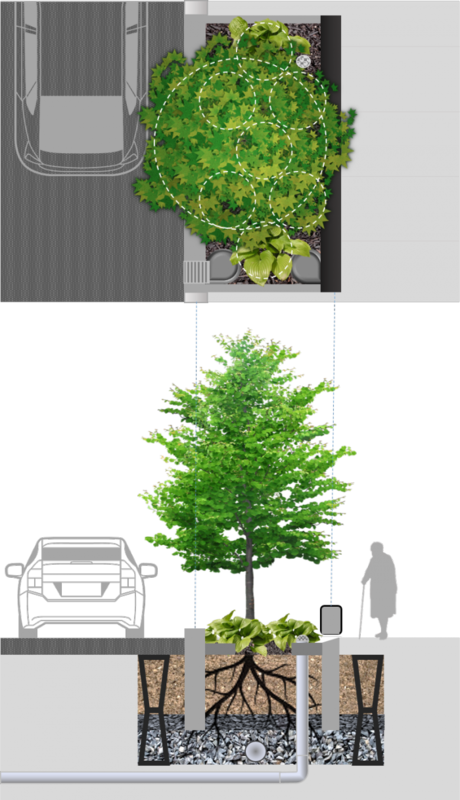 is influenced by a number of factors including tree architecture and it has been estimated that a typical medium-sized canopy tree can intercept as much as 9000 litres of rainfall year. (Crockford and Richardson, 2000). A study of rainfall interceptionThe interception, storage and eventual evaporation of rainfall from vegetation canopies. by street and park trees in Santa Monica, California found that interceptionThe interception, storage and eventual evaporation of rainfall from vegetation canopies. 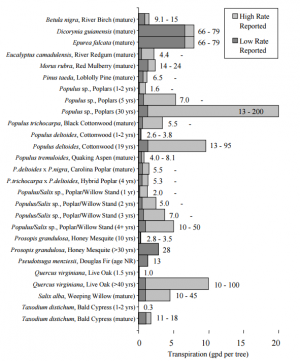 rates varied by tree species and size, with broadleaf evergreen trees provided the most rainfall interceptionThe interception, storage and eventual evaporation of rainfall from vegetation canopies. (Xiao and McPherson, 2002). Rainfall interceptionThe interception, storage and eventual evaporation of rainfall from vegetation canopies. was found to range from 15.3% for a small jacaranda (Jacaranda mimosifolia) to 66.5% for a mature brush box (Tristania conferta now known as Lophostemon confertus). Over the city as a whole the trees intercepted 1.6% of annual precipitationAny form of rain or snow. and the researchers calculated that the annual value of avoided stormwater treatment and flood control costs associated with this reduced runoffThat potion of the water precipitated onto a catchment area, which flows as surface discharge from the catchment area past a specified point.Water from rain, snow melt, or irrigation that flows over the land surface. was US$110,890 (US$3.60 per tree). 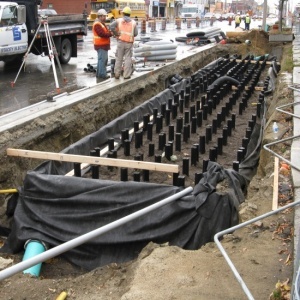 Soil cell installation on Central Parkway in Mississauga. Built in 2014, this stormwater planterA vegetated practice that collects and treats stormwater through sedimentation and filtration. Contributions to water cycle/water balance are through evapotranspiration only; no infiltration. on Central Parkway in Mississauga uses supported soil cells and is functioning well.